Your necklace becomes your fitness trainer. Your headband documents your life. Your watch becomes your personal assistant. It seems like science fiction when our technology becomes so anthropomorphic. But with smartbands tracking our every movement through sensor networks and collecting real-time data on our lifestyles, body-hacking isn't just for fitness fanatics and quantified-self junkies anymore. The Bluetooth-enabled Jawbone UP24 band, available at Verizon Wireless stores, sends data to your personalized UP app, delivering insights, nudges, and notifications to your phone. If most smart fitness bands are like a daily appointment with a personal trainer, Jawbone UP24 is more like a life coach, gently navigating you through the day. It's not just another wearable — it's a much-needed companion for anyone reluctantly upping their wellness game. Here's how Jawbone UP24 is helping wearable tech go mainstream. 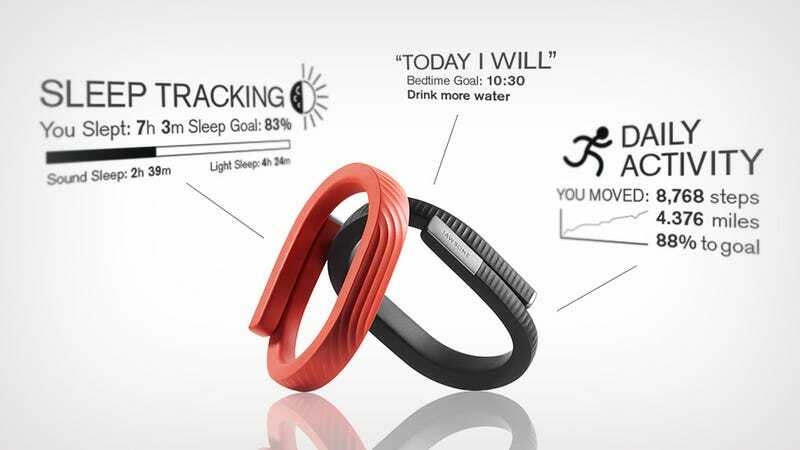 Jawbone's UP24 is the fashionista of smartbands. Its sleek and slender design stands apart from bulkier offerings in the market — it adjusts to your wrist size and comes in gender-neutral color options, escaping earlier criticisms that wearable smartbands were too masculine and rugged. This design is discreet: no one will spot you for a tech nerd or a fitness freak. The soft, rubbery material also makes it comfortable while sleeping and working out. While the band is stylish, the app component is really the jewel of the UP24 platform. Without meaningful context, all those vitals you're tracking can feel like bloated data glut — TMI can get discouraging when it comes to wellness. But Jawbone's UP24 app sends helpful reminders to make healthy choices, like more daily movement or increased water intake. The notifications feel like helpful nudges, not nagging jabs. And since the band has Bluetooth connectivity, it can also send you new, personalized goals throughout the day to help you achieve the results you want. After a few days of use, the app rewards you with "Streaks" or milestones, encouraging you to keep on track. It also helps you meet your own personal challenges. The "Today I Will" feature allows you to set goals for yourself, like getting more sleep. Then it helps you execute them: tools like the Smart Alarm wake you up at the best time based on your body's natural sleep cycle. When you wake up, the app sends you a note on how well you slept and for how long. The company uses this data to gather insights on the impact of their features, further building on what's working for their users. They even have a resident data scientist, Monica Rogati, whose job is to track macro trends among users. She found the "Today I Will" feature actually has a significant impact on people's behavior — 72% of users were more likely to go to bed early enough to hit their sleep goal. In his design statement about the product, Chief Creative Officer and famed industrial designer Yves Behar said "Creating a product that could be worn 24/7 has been the most demanding design challenge in my experience so far." But the company's expertise in miniature sensors "allows the company to pack the wrist band with technical complexity" — a processing core battery, vibration motor, sensors, and memory. To some critics' dismay, the UP24 is noticeably lacking what its competitors sport proudly: a screen. But going screenless enables a strong battery life that lasts up to seven days. Besides, the average smartphone user checks his or her phone 150 times a day. Why compete? Wearable tech works behind the scenes to record our behavior and produce life-altering insights. But we want it to be more than a smart coach — we want it to act as an attentive and intuitive friend. Jawbone's UP24 is just that, providing us with beautiful insights to help us make better choices. Grab one at Verizon Wireless, home to all things innovative. For more glimpses of how technology is shaping the future, head to homeofthefuture.gizmodo.com. This post is a sponsored collaboration between Verizon and Studio@Gawker.